Do you ever feel like your projects look too cute wherever you put them to actually finish them especially when, potentially, you have to part with them? Well, that thought certainly hit me when I looked at my bookshelf yesterday... 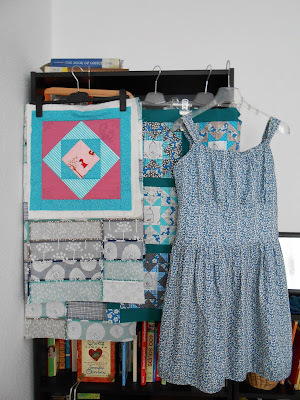 They go together so well I'm can't even stop putting my finished dress there. I am, however, steadily working on completing my pretties - despite the heat. Geesh, one must be seriously masochistic to be ironing when it's nearly 40°C outside, right? My sister definitely thinks so but she's no sewist and it's worth it. 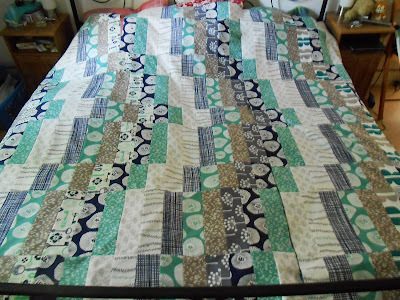 I've now finished three sections (two 9x10 and one 9x12) of the anniversary quilt. I have another row of wide strips that I will assemble, then cut in half and add to each side before assembling the section. Even then, the quilt won't cover the sides of the bed if placed like this, though. As evidenced by the picture above. It should cover everything if placed sideways like this. 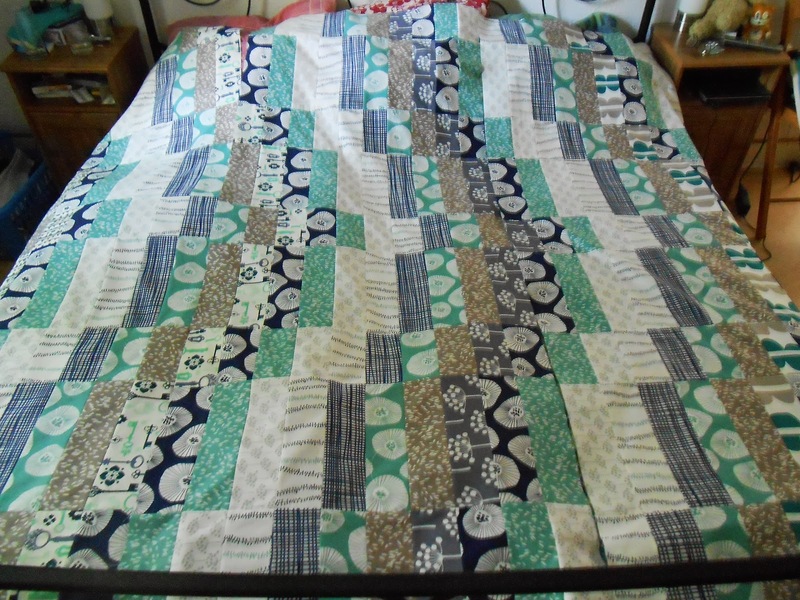 Then again, I haven't prewashed my fabric this time around so I'll have to expect some shrinkage which would mean that even put sidesways the quilt isn't a 100 per cent fit for our bed. I will have to come up with an idea to add some more width/length. Maybe a wide strip of solid on both sides (top and bottom in this picture)? 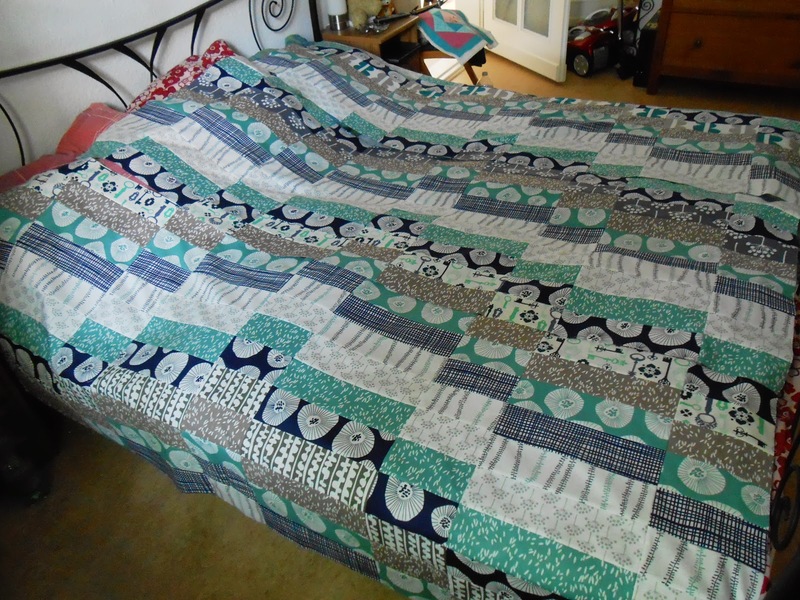 I could probably even skip the narrow column on each side mentioned above and save those strips for pillows. Hmm. Anyway, serious question - which placement do you prefer? 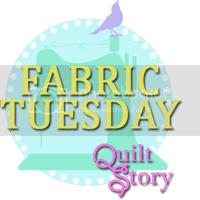 Happy sewing and check out these great linky parties! I think in prefer the first layout although I can't put my finger on why :). Can't wait to see what you decide to do with it! I like the horizontal layout better. 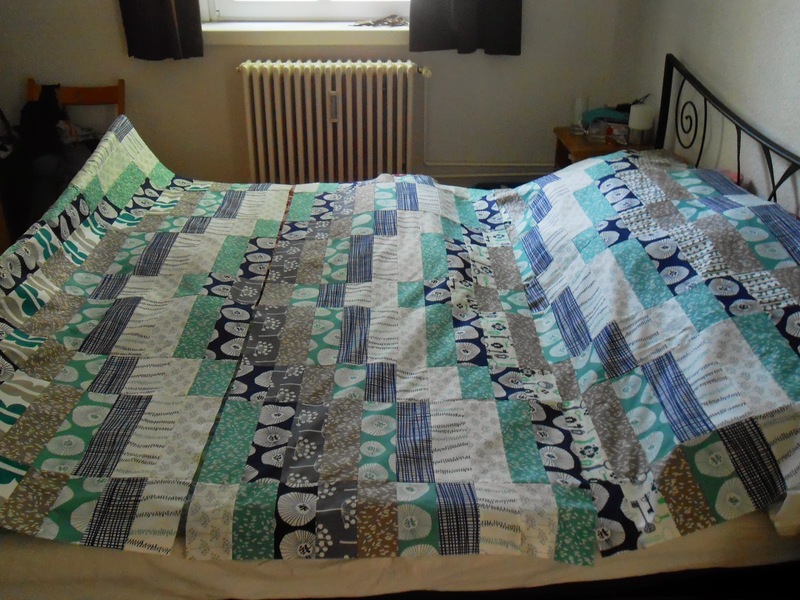 Could you fold in at the bottom of the bed instead of laying it out completely? Maybe layer it with something else? They are both lovely, but I like the first one better. The "points" in the pattern flow from the back to the front and create a nice leading line. Looking fab! 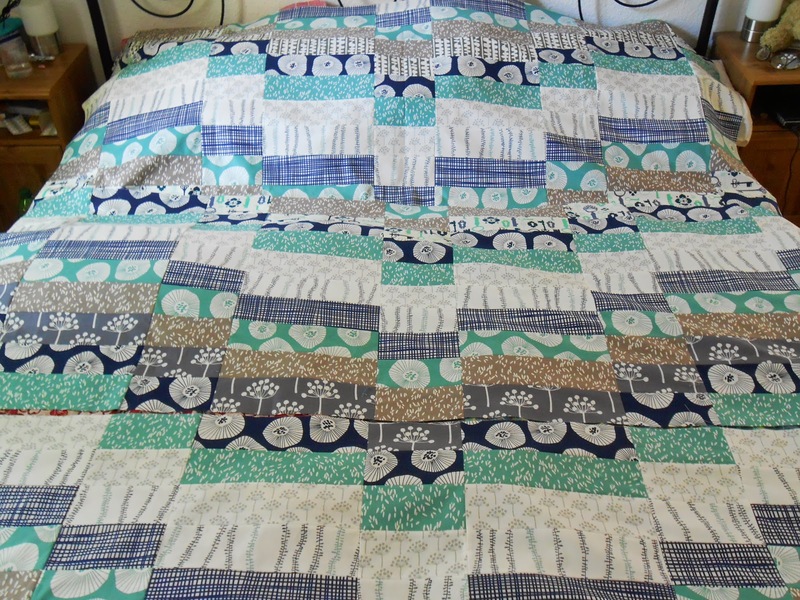 I do think I like the first layout better -and a solid to match for the sides to make it big enough and matching pillows! I have to agree with the majority. I like the first layout better. 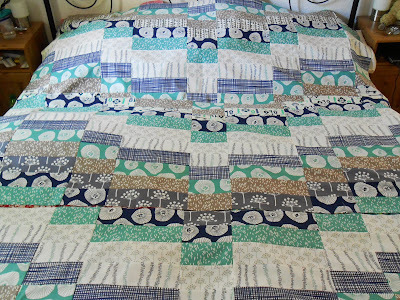 Such a pretty quilt either way though! I have to go with the majority as well, the first layout for sure. Maybe with a strip of matching solid on each side to reach the drop you need, then the remaining strips of pattern that you still need to assemble to tie it back in?, just a thought! But whatever you do it's already gorgeous! Horizontal gets my vote! Its looking great by the way!